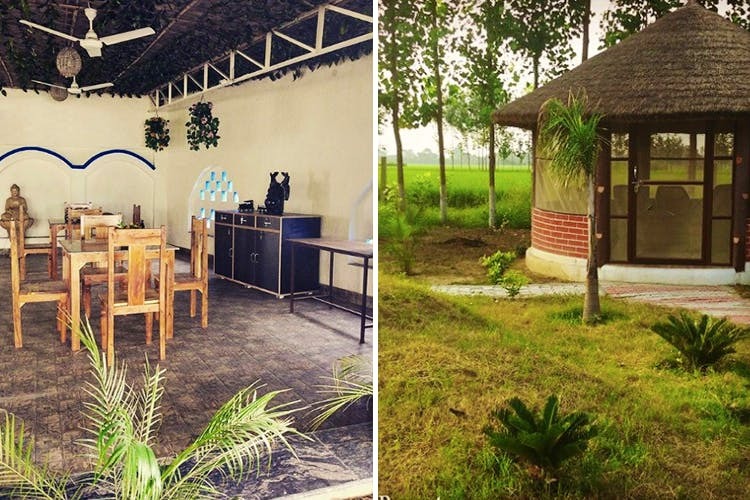 Escape To This Secret Farm In Karnal That's In The Middle Of A Lake! Tired of the city and can’t afford to take any more leaves? Head over to Lake View Farm in Karnal to enjoy fields of gold and green, play with farm animals, have a farm-to-fork experience and enjoy a bunch of exciting activities. The Lake View Farm in Karnal is the perfect retreat from the chaos and pollution of the city. Take your family for a mini getaway to this rustic farm spread over seven acres, where you can unwind and kick back. The coolest part? The farm is literally on a lake. Definitely beats staying in a regular hotel. Won’t you agree? If you’re a sucker for farm activities like us, they’ve got a bunch of fun things to do here. You can go boating or fishing in the lake, or take a dip in their massive, chlorine-free pool (extra points for this). They’ve got a farm-to-table restaurant for their guests with produce from their own fields and you also get to go forage plucking. Your kids (and you too, let’s face it) will love tractor rides and playing with the animals on the farm, they’ve got some really cute chicks, ducklings and calves. If you’re just in the mood to be lazy with bae, just lounge on the hammocks with a book or catch up on sleep in their simple, but nicely done-up rooms. We hear they have accommodation in a bamboo hut and tent accommodation for when the weather’s better. Oh, and when you’re done sleeping, try their outdoor activities like archery, kite-flying, a bonfire and barbecue nights. We’re already looking forward to going here (long weekend, maybe?) – it’s just a two hour drive from Gurgaon. They charge INR 2,500 per night. Check out their page on Instagram and it’ll make you want to book right away. You can call the owners on +919004999635 to make a reservation. P.S. They’ve also hosted weddings and had people over for shoots because of their pretty, open surroundings.